This Master Mind Development Group is a resource for people who are serious about maximizing their profitability from either Residential or Commercial Real Estate Development. The membership gives you access to the collective knowledge of Colm Dillon, gained from developing over $1.2 Billion worth of projects across all market sectors. Those market sectors include high rise and low rise apartments / condos; office; land development; industrial; resort and large hotels. Membership gives you access to a wealth of valuable information, tips and tricks all aimed at helping you complete your development projects successfully. There is no other membership like it in the world. Colm Dillon is the owner and creator of RealEstateDevelopmentCoach.com; has successfully developed over $1.2 Billion worth of developments and is the only real developer who has ever written instructional ecourses for this industry ... EVER! Over the past 4 years Colm Dillon has taught thousands of "individuals" how to develop real estate for their personal profit and they are doing it in the multo millions right now. Being able to support thousands of "individuals" who have been members gives Colm Dillon a unique insight into what these individuals ... from newbi to 20 year experienced developers need and how to help them. Just as importantly, he sees the simple and costly mistakes that some people have made prior to joining his Master Mind Group and the pleasure they enjoy when he "lifts the veil" to help them get back on track ... imvaluable! Colm Dillon is all real world, applicable experience that he gives his members ... from his mouth to your ears weekly. By joining MMG you have access to Colm Dillon for at lease one hour every week - not his staff; he doesn't have any. This work can only be done by one individual AND Colm Dillon is the only one who does it or has ever done it. When you join Colm Dillon's Master Mind Development Group you will have access to his Web Conference Room, where you can talk free of charge using a head microphone and your PC. There is no need to struggle on your own. 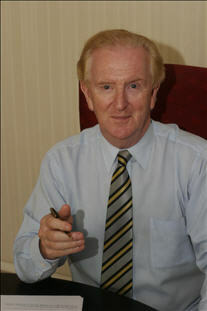 Colm Dillon is here to help and to share hos vast experience with you. All his extremely valuable knowledge is given to you at a very affordable price of $10 a week. What would you pay for an hour's time of a lawyer, doctor or vet ... and they cost you money, not help you make it! Passing up this unique invitation is not smart ... in fact, it can be very costly. But passing up an introductory cost of $10 a week suggests that you should think again about getting into the real estate development business in the first place. Question. How many people do you know have an opinion on, real estate investment? Answer. Just about everyone you know, right. Question. How many people do you know have any usable knowledge on, real estate development? Answer. Just about no one you know, right. Question. If you could ask Donald Trump questions on your development every week for an hour; would you do it? Answer. Are You Mad; Of Course I Would. Well, you can't sorry, he's still working. Donald Trump's developed $3.6 Billion worth of projects and building more. But You Can do something about it. Colm Dillon's developed $1.2 Billion worth of projects and he's and giving back to the industry he loves right now. Question So What Are You Going To Do? Answer Ptetty Obvious; I'm Subscribing Right Now!